We are a locally-owned community pharmacy dedicated to providing outstanding customer service at an affordable price. 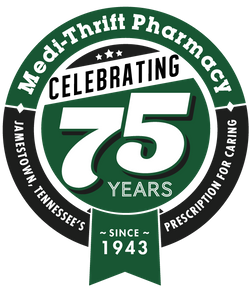 At Medi-Thrift Pharmacy, we aim to provide personalized customer service with short wait times. We are a group of local people that care about our community and the relationships we have with our patients and physicians. We are the oldest pharmacy in the county and are committed to providing the highest standard of quality and service. 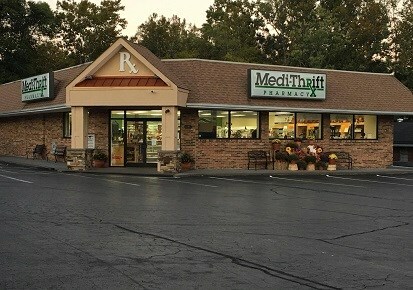 Medi-Thrift Pharmacy is proud to be your source for all of your pharmaceutical needs. We offer a wide variety of services including conventional prescription filling, medical supplies, health screenings, free delivery and much more. We also offer a wide selection of cards and gifts that are perfect for any occasion. Visit us today to experience what personalized care for over 75 years feels like. We offer delivery for your convenience throughout the county. Just choose delivery through our mobile app or website when refilling prescriptions. We carry a wide selection of medical equipment, including ambulatory aids, nebulizers and diabetic supplies. We offer onsite health screenings that allow you to get more information on your health without having to make a trip to the doctor.